Most paint tools share a standard set of options; some options apply to only specific paint tools. When options are adjusted, the changes apply to all of the relevant paint tools, not just the currently-selected tool. We’ll cover here many of the standard options that apply to multiple paint tools. Note that most options have a “Reset” icon on the right to return them to their original status — though, closing Gimp without saving the Tool Presets works, too! The drop-down of application modes include options such as normal, dissolve, lighten, darken, overlay, soft light, hard light, etc. The opacity slider allows you to adjust a brush’s transparency level. The brush option allows you to select from 54 different brush types, include solid and mottled brushes, a sun, and even a green pepper! The size of the brush can easily be adjusted via this option. 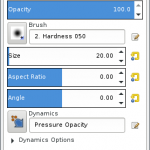 The aspect ratio adjusts the ratio between the width and height of a brush. The dynamics option adjusts how much the speed/pressure/etc. of the mouse or input device affects the brush strokes. The dynamic options are hidden, but can be expanded, allowing you to adjust fade/repeat/reverse/color options for the dynamic selection. The apply jitter option allows you to set how far apart or close together brush strokes are, so that they result in continuous lines — or not! 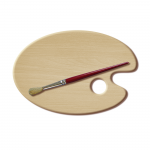 The smooth stroke options allows you to adjust the quality and weight of your brush strokes. The incremental option allows you to over-ride the opacity slider’s settings if it is less than 100%. Holding down the Ctrl key while using the pencil will activate the “color picker” so that you can quickly select a new color. Holding down the Shift key while using the pencil will guide you in using the tool in a straight line. Holding down the Ctrl key while using the paintbrush will activate the “color picker” so that you can quickly select a new color. Holding down the Shift key while using the paintbrush will guide you in using the tool in a straight line. Holding down the Ctrl key while using the airbrush will activate the “color picker” so that you can quickly select a new color. Holding down the Shift key while using the airbrush will guide you in using the tool in a straight line. Holding down the Ctrl key while using the ink tool will activate the “color picker” so that you can quickly select a new color. Holding down the Shift key while using the ink tool will guide you in using the tool in a straight line. Holding down the Ctrl key while using the bucket fill tool toggles the use of the background fill color vs. the foreground fill color. Holding down the Shift key while using the bucket fill tool toggles the use of “Fill Similar Color” and “Fill Whole Selection”. Holding down the Ctrl key while using the blend tool creates straight lines that are constrained to 15 degree absolute angles. Holding down the Ctrl key while using the eraser will activate the “color picker” so that you can quickly select a new color. Holding down the Shift key while using the eraser will guide you in using the tool in a straight line. Holding down the Ctrl key while using the clone tool will set a new clone source (set reference points for copying). Holding down the Shift key while using the clone tool will guide you in following a straight line. Holding down the Ctrl key while using the perspective clone tool will allow you to select a new clone source. Holding down the Shift key while using the perspective clone tool will allow you to see a thin connecting line between the previously clicked point and your pointer location (if the source is set). Holding down the Ctrl key while using the heal tool will allow you to select the source, to heal from any layer of an image. Holding down the Shift key while using the heal tool will guide you in using the tool in a straight line. Holding down the Ctrl key while using the convolve tool will switch from blur mode to sharpen mode. Holding down the Shift key while using the convolve tool will guide you in using the tool in a straight line. Holding down the Shift key while using the smudge tool will guide you in using the tool in a straight line. Holding down the Shift + Ctrl keys will allow you to constrain the angle between two successive lines to vary by steps of 15°. Holding down the Ctrl key while using the dodge/burn tool will switch from dodge mode to burn mode. Holding down the Shift key while using the dodge/burn tool will guide you in using the tool in a straight line. To better understand each paint tool and its options, I recommend opening up an image in Gimp and trying out each tool, adjusting various options as you go.